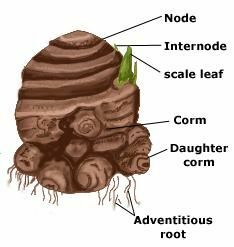 Bulb and corm are the underground stem modifications in which stems are seen below the surface of the soil and are modified to store the food. The stem is a condensed, discoid structure. The stem is a cylindrical, vertically growing structure. Adventitious roots develop from the ventral side of the stem. Adventitious roots develop all over the stem. Food is stored in the leaf bases. Food is stored in the stem.